Harbor Park‘s riverfront location often puts in the middle of strong winds, posing some challenges for the Norfolk Tides (Class AAA; International League) and their opponents. Originally opening in 1993, Harbor Park is located along the Elizabeth River and generally has a reputation as a tough environment for hitters. The location often leads to windy conditions at the ballpark, which has an effect on how far the ball carries–the Tides only hit 39 of their 103 home runs at home last season, and the 278 long balls hit there over the past three seasons mark the second-lowest total in the International League over that period (ahead of only Indianapolis). It can also create challenges on defense, with position players having to adjust to tough conditions for tracking fly balls and pop ups. 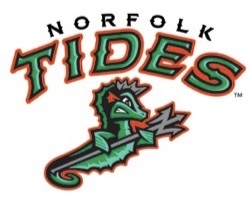 The Tides will have time in the early-stages of the season to get acclimated to the ballpark, as last Thursday’s contest marked the beginning of an 11-game homestand. The Durham Bulls come to Norfolk for four games starting on Monday, with the Charlotte Knights visiting the Tides for a three-game weekend series that starts on Friday.